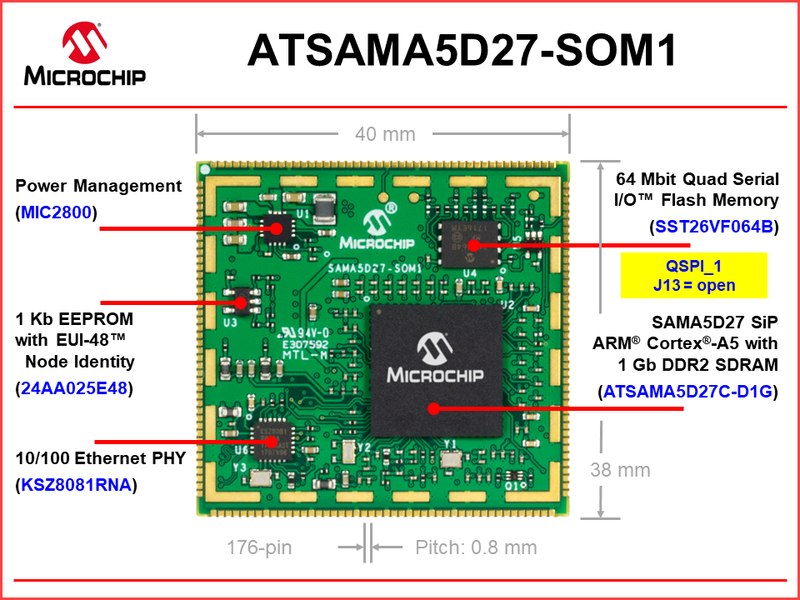 This topic describes the features of the ATSAMA5D27-SOM1-EK1 with links to additional information. The SOM’s backup power VDDBU is supplied by Super Capacitor C14. There are two mass storage and one external memory options on the baseboard. The first is J12, a MultiMediaCard (MMC) plus or Secure Digital (SD) Memory Card slot. J12 is connected to the Secure Digital MultiMediaCard port 0 (SDMMC0) peripheral of the ATSAMA5D27-SOM1. The second is J14, a micro Secure Digital (microSD) Memory Card slot. J14 is connected to the Secure Digital MultiMediaCard port 1 (SDMMC1) peripheral of the ATSAMA5D27-SOM1. An external memory option is available on the baseboard. U9 is an unpopulated PCB footprint for a Quad Serial I/O™ Flash memory. 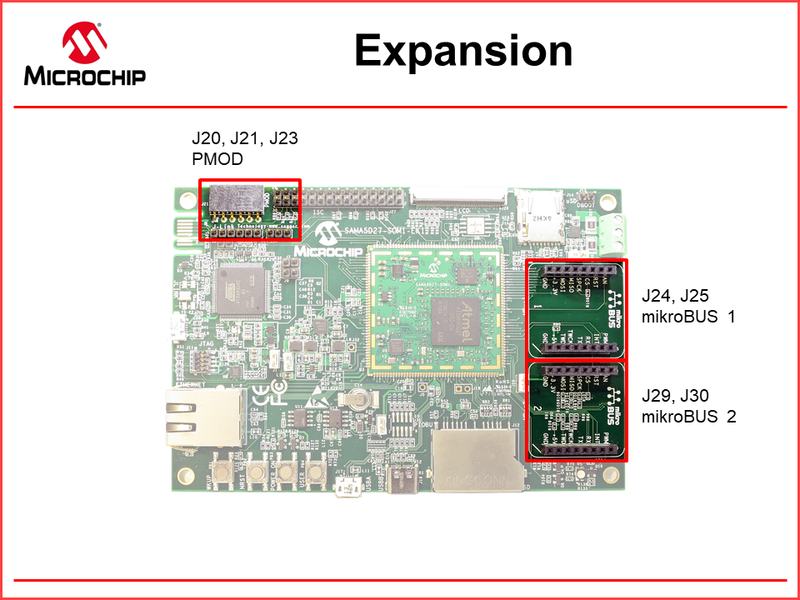 U9 uses the same peripheral I/O (PIO) pins as the Quad Serial I/O Flash memory resident on the ATSAMA5D27-SOM1. 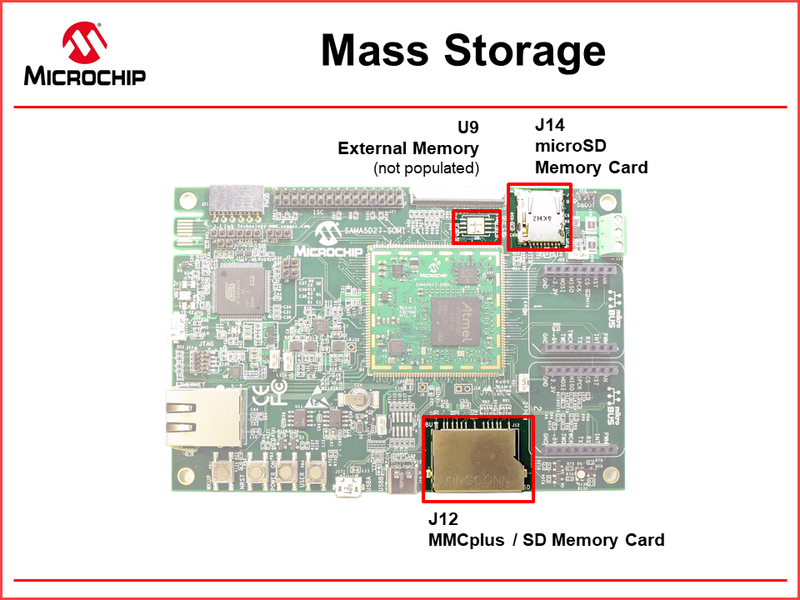 Thus, both external memories are connected to the Quad Serial Peripheral Interface (QSPI) peripheral of the ATSAMA5D27-SOM1. Jumper J13 open (default) selects external memory on the SOM. J13 closed selects external memory on the baseboard. The ATSAMA5D27-SOM1-EK1 provides wired communications via Ethernet, USB, and CAN. Onboard the SOM, the ATSAMA5D27C-D1G SiP contains an Ethernet MAC (GMAC) peripheral. It is connected to a 10Base-T/100Base-TX Ethernet physical layer transceiver, KSZ8081RNA. A unique EUI-48™ MAC address is provided by a 2 Kb Serial EEPROM, 24AA02E48. On the baseboard, an Ethernet integrated magnetics connector, J15, provides a connection to CAT 5 or CAT 6 Ethernet cables. 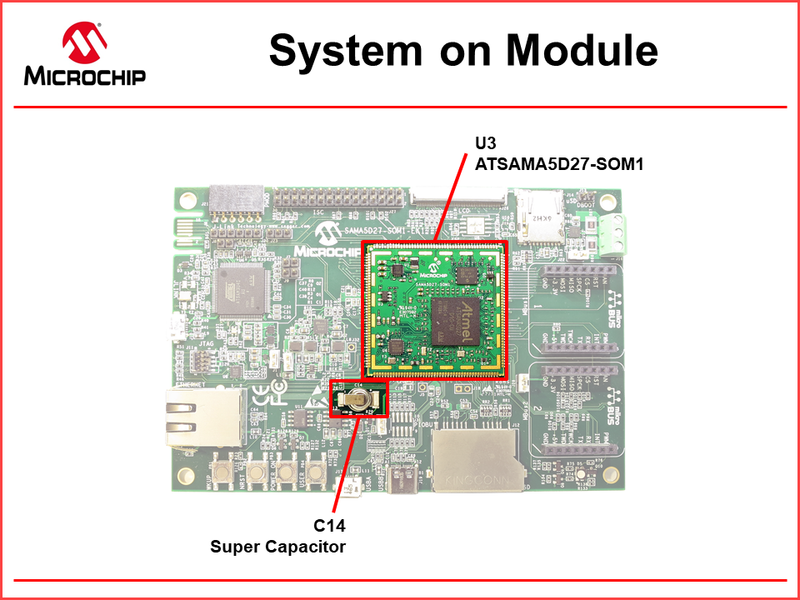 Onboard the SOM, the ATSAMA5D27C-D1G SiP contains one high-speed USB Device, one high-speed USB Host and one High-Speed InterChip HSIC Interface. The USB High-Speed Device Port (UDPHS) is connected to J17, a micro-B USB connector. 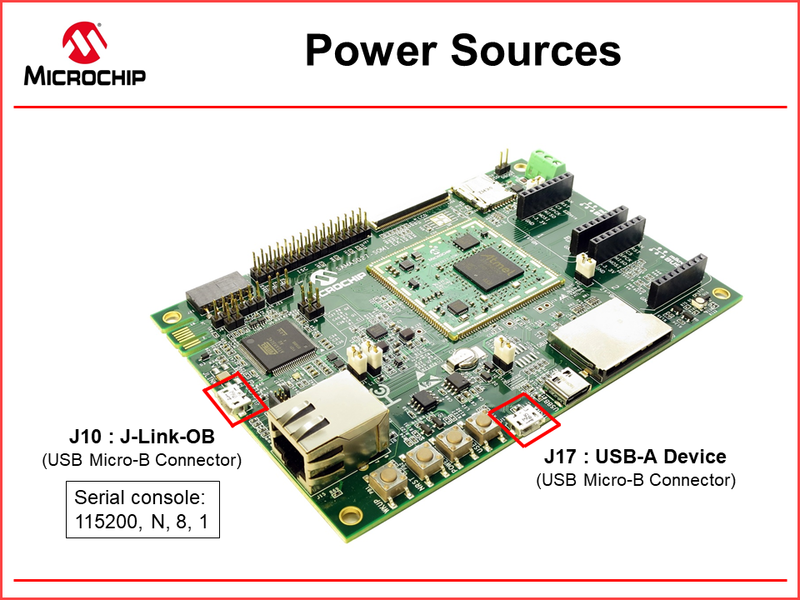 J17 is one of two power options for powering the ATSAMA5D17-SOM1-EK1. For more information on how to power the baseboard see the Power Options section below. The USB Host High-Speed peripheral (UHPHS) is connected to J19, a USB 2.0 Host Type-C connector. 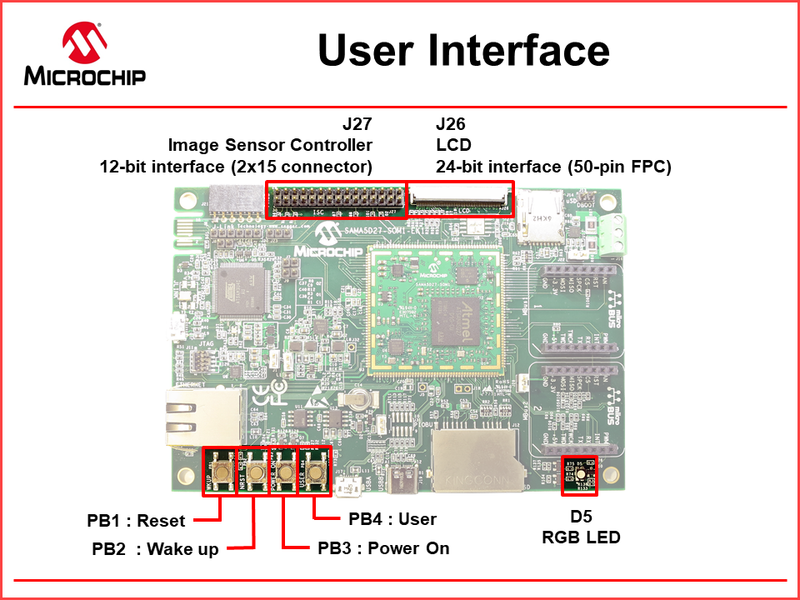 The USB High-Speed InterChip connector J18 is not populated. The HSIC port is controlled by the USB High-Speed Device Port (UDPHS). Onboard the SOM, the ATSAMA5D27C-D1G SiP contains a Controller Area Network (MCAN) peripheral. It is connected to an ATA6561 transceiver and a three-pin screw terminal J16. There are two methods of debugging the ATSAMA5D27-SOM1-EK1. The first is by JTAG interface and the second by an onboard SEGGER J-Link. A JTAG interface to the ATSAMA5D27 on the SOM is provided by 10-pin connector J11. 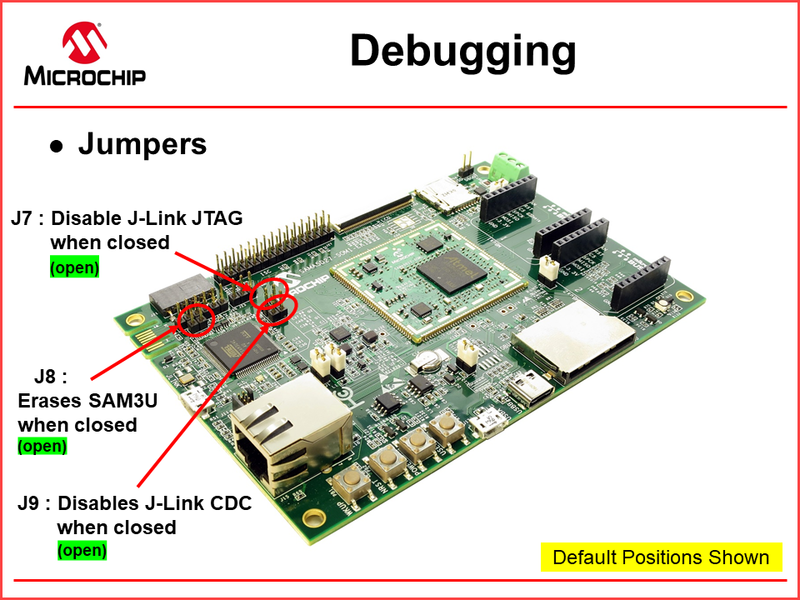 The baseboard contains an onboard SEGGER J-Link debugger. Microcontroller U4 and support circuitry contains JTAG and J-Link functionality. Microcontroller U4 provides USB CDC class serial communications via micro-B USB connector J10. J10 is one of two power options for powering the ATSAMA5D17-SOM1-EK1. For more information on how to power the baseboard see the Power Options section below. 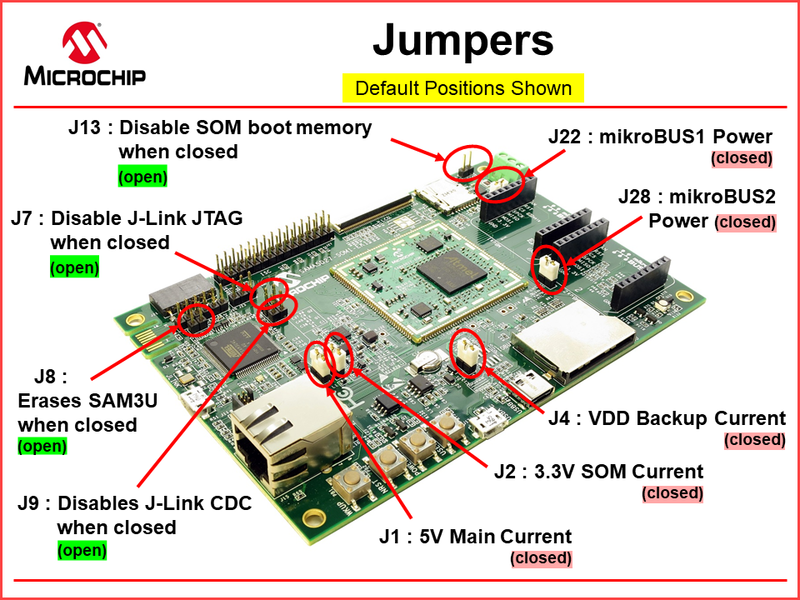 The above figure shows the jumpers associated with debug functionality. Ensure jumpers J7, J8, and J9 remain open (default). For more information on all baseboard jumpers see the Jumpers section below. The baseboard contains eight tamper pins at J31 for static or dynamic intrusion detection, UART reception, and analog pins for comparison. 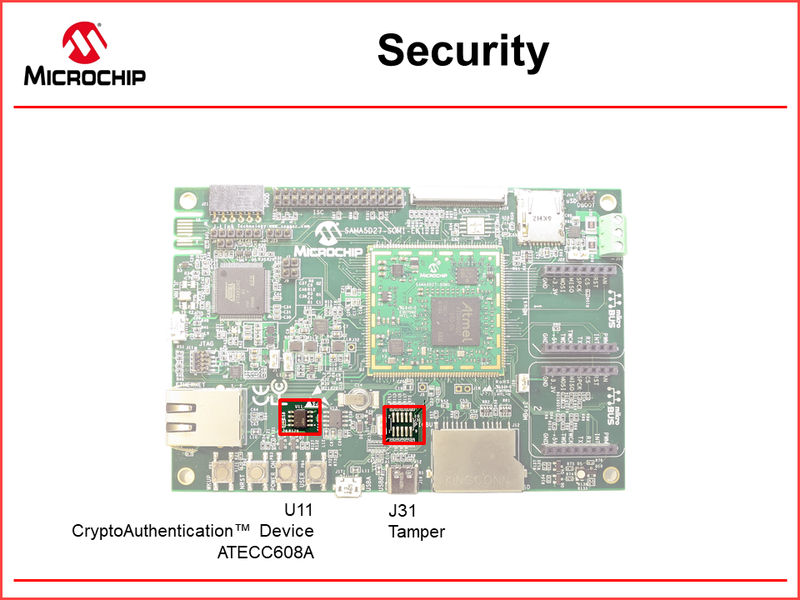 The baseboard contains an ATECC608A CryptoAuthentication™ device. U11 is a cryptographic co-processor with secure hardware key storage. The ATSAMA5D27 SiP on the SOM contains an Image Sensor Controller (ISC) that supports up to 5 M-pixel sensors with a parallel 12-bit interface for Raw Bayer, YCbCr, Monochrome and JPEG-compressed sensor interface. The ISC I/O lines are available on baseboard 2x15 connector J27. The ATSAMA5D27 SiP on the SOM contains a Liquid Crystal Display (LCD) Controller (LCDC) that supports a variety of LCD Displays. The LCDC I/O lines are available on the baseboard 50-pin Flexible Flat Cable (FFC)/Flexible Printed Circuit (FPC) connector J26. RGB LED D5 can be controlled by the user via GPIO PWM or timer/counter I/O pins. The baseboard contains four push buttons. PB1 Reset will reset the baseboard. PB2 Wake Up will wake up the processor when it has been shut down by software. 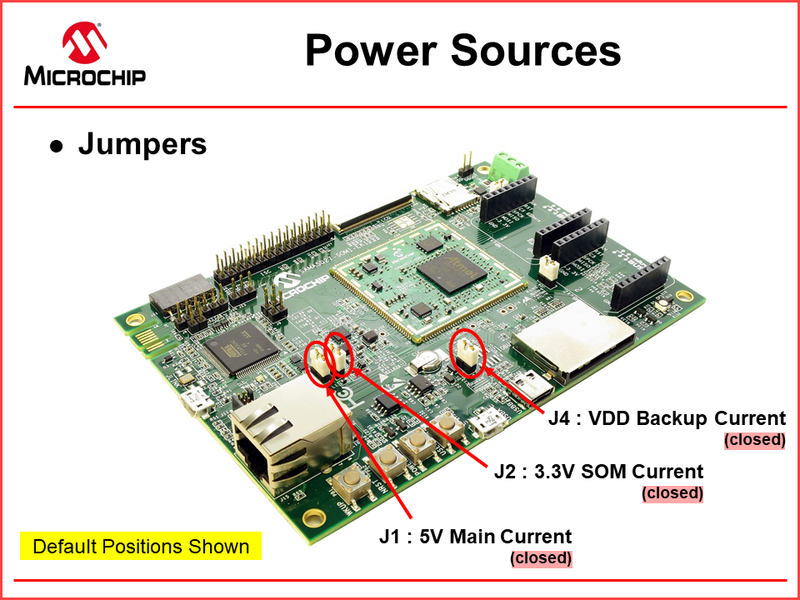 PB3 Power On is part of the baseboard Shutdown Circuitry. This circuitry (by default) is inhibited (R131 is not populated). Refer to the ATSAMA5D27-SOM1-EK1 User’s Guide for more information. PB4 User push button connected to PIO PA29. Pmod™ peripheral modules are small I/O interface boards that extend the capabilities of development boards such as the ATSAMA5D27-SOM1-EK1. They are made by Digilent®, an electrical engineering products company serving students, universities, and OEM's worldwide with technology-based educational design tools. The baseboard contains a 1x6-pin connector J21 that supports Pmod module communications. A set of jumpers J20 and J23 are used to configure the Pmod interface for SPI, TWI, or USART. mikroBUS™ socket is a proprietary communication and plug-in standard for small interface boards called Click Boards™ that extend the capabilities of development boards such as the ATSAMA5D27-SOM1-EK1. They are made by MikroElektronika, a producer and retailer of hardware and software tools for developing embedded systems. Power to the mikroBUS communication sockets are provided by J22 and J28. Both should be closed (default) to power their respective sockets. 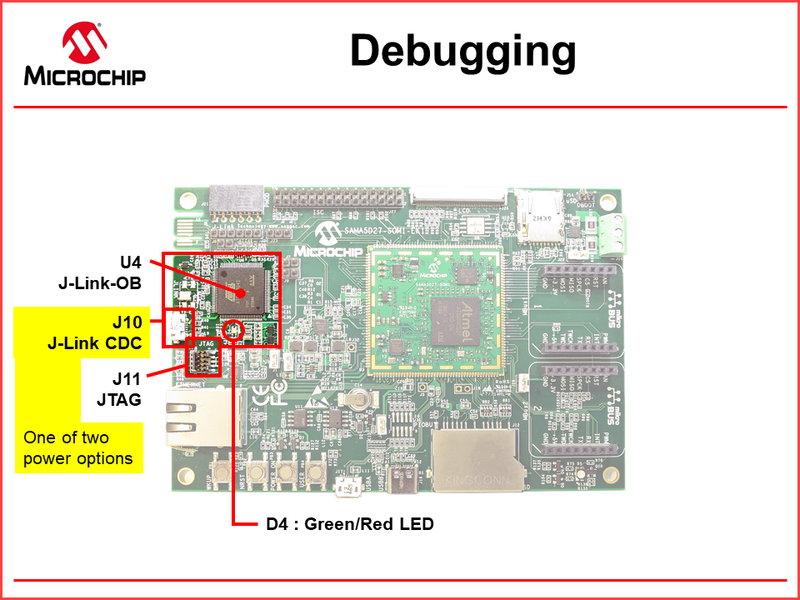 J10 serves as USB device serial communication to the onboard J-Link debugging circuitry. It also serves as USB device serial communications to the Linux console. 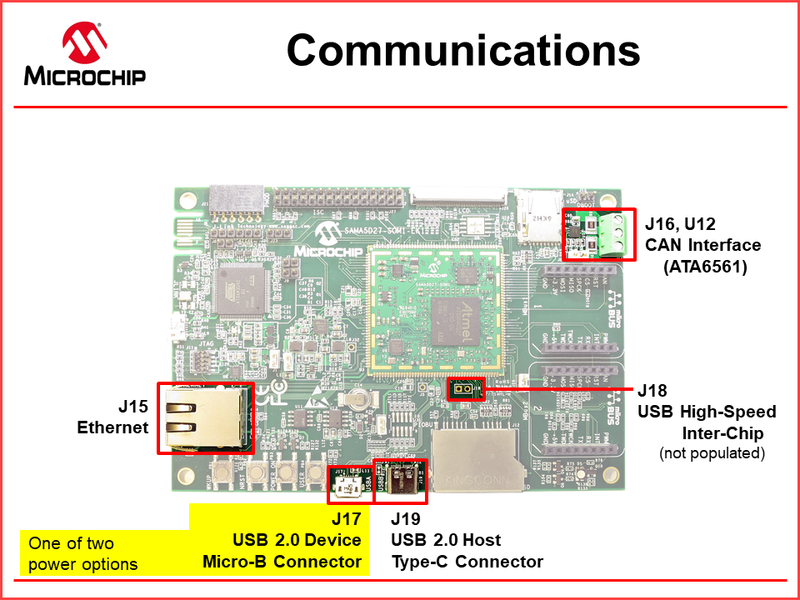 J17 serves as USB device serial communications to the ATSAMA5D27-SOM1. A priority mechanism manages automatic power source switching between J10 and J17. The figure above shows the jumpers associated with power to the baseboard and ATSAMA5D27 SOM. The figure above lists all the jumpers of the ATSAMA5D27-SOM1-EK1 and their default positions. After you familiarize yourself with the Features of the ATSAMA5D27-SOM1-EK1, you may wish to proceed to learn - Booting a Linux Image onto the development board.